Want to start getting leads for your business NOW? 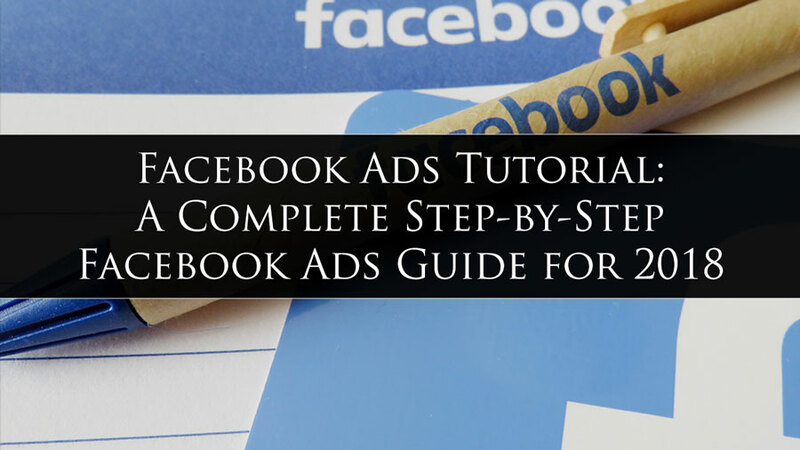 Facebook ads is the quickest way to do that, and with this step-by-step Facebook ads tutorial on how to start using paid marketing on Facebook, we're going to get you there in no time. 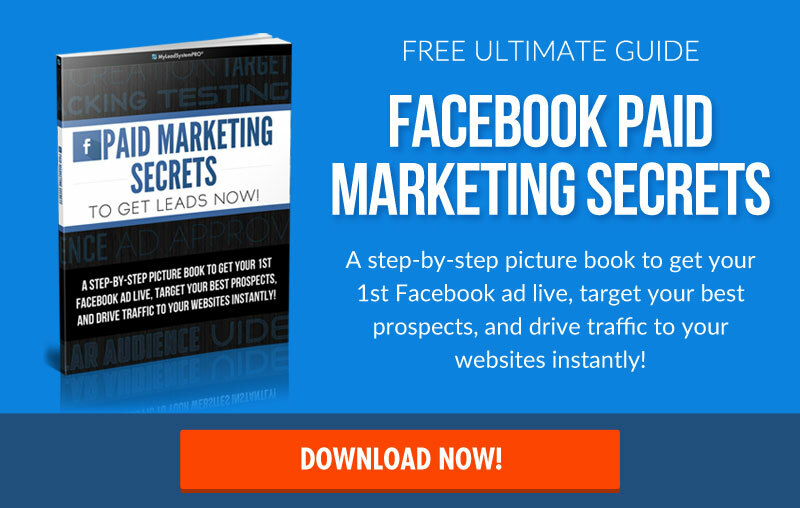 Following the steps covered in this PDF will get your business up and running on Facebook with some of the best practices you can use today! 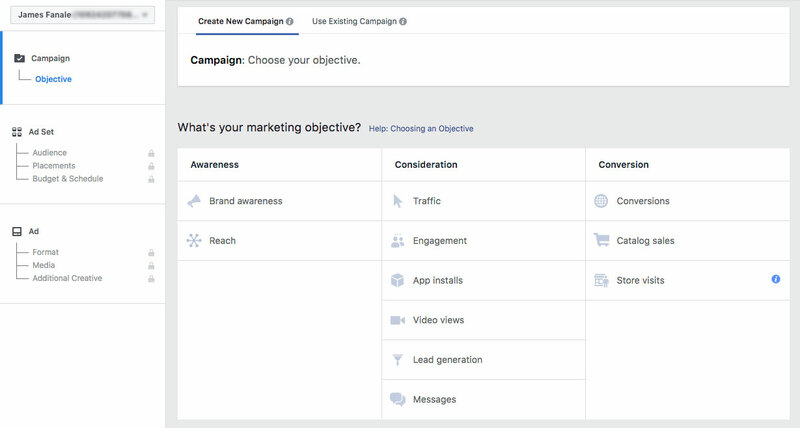 In part one in this Facebook ads tutorial, we need to get clear on not only what Facebook is, but WHY people are on Facebook. Knowing this information (especially when it comes to your target market) will GREATLY improve your chances of winning with Facebook ads. Facebook is a meeting place for 20% of the worlds population. That’s 1 in 5 people. It is also the largest collection of data on the worlds population that ever existed in the history of humanity. It has data on its 2 Billion members and on anyone who uses the internet and visits a website that has Facebook tracking code… Whether you are logged in as a member of Facebook or not. Facebook is the most valuable property on all of the internet. Now the thing that most people don’t realize is that Facebook also knows where you go on the internet and what you do while you are there. So again… Yes Facebook is a Social Network… However it is also the worlds largest collection of behavioral data. What Can Facebook Do For Your Business? Facebook can be an instant source of traffic to your website. It can be an immediate source of leads for your business with verified contact information like name email address and phone number. It can allow you to 'retarget' and re-engage with your visitors (and soon-to-be buyers) who have abandoned your website, shopping cart, sales funnel, or anywhere else you are engaging with your audience. You can generate sales of products directly on Facebook or through ads that track sales conversations on your website. You can build a presence on Facebook with a Fan Page and or Group and engage with them on a regular basis to build and maintain mindshare. And Facebook can provide you with some incredible information about your target market and your existing customers and prospects. Facebook can do much more but these are some of the primary benefits to a business. What does Facebook Want From You? Now let’s take a look at what Facebook wants from you as a business. (And when I say Facebook I am referring to both the company and Zuckerberg, as well as Facebooks users). The very first thing for you to know about Facebook, is why people are there. Why are 2 Billion people spending so much time on Facebook. People DO NOT go on Facebook to solve a problem. People DO NOT go on Facebook to buy a product or service. Facebook does have initiatives in place that are slowly changing the behavior of its members. Can you buy stuff on Facebook? Yes. Are people going there specifically to shop? No, although this is slowly beginning to over time. But for now this should be a core part of your foundational understanding of Facebook. The very first reason and the primary reason is to connect. Connection is one of the most important human needs and Facebook has become one of the primary ways that our culture at this time through out all societies connects with each other and helps us to stay connected regardless of the distance between us. Friends and Family can be at that furthest point on the other side of the globe and we can still be a part of their daily lives as a result of Facebook. 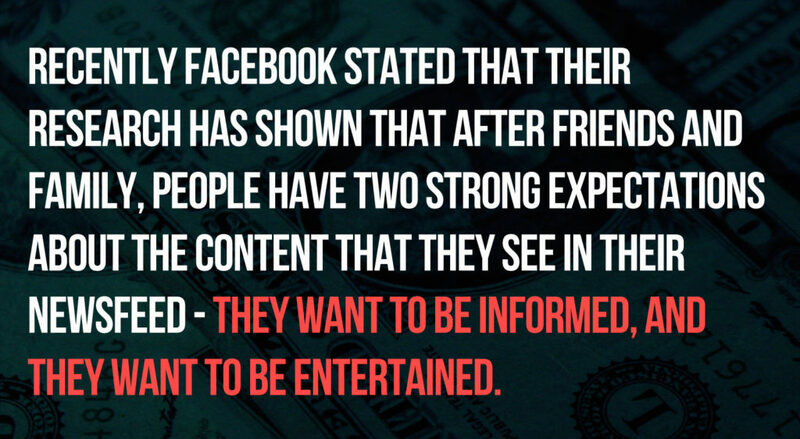 Sharing is the next primary reason that people are on Facebook. Self expression is about significance which is another basic human need. We all want to feel connected but we also want to feel unique and significant. When we share parts of our lives and other people are liking, commenting and sharing what we have shared it makes us feel significant and validated as an individual. And we are there to be entertained & informed. It breaks up the monotony of the day. We go there to escape and get an instant slice of feel good. Be it a funny quote, or an image of grumpy cat… The most shared content on all social networks are posts that are entertaining. 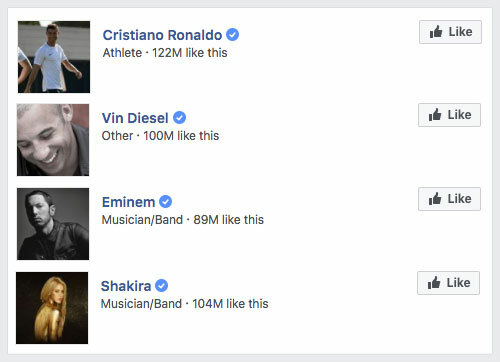 The is also why the Facebook pages with the most fans belong to celebrities and athletes like Soccer Player Cristiano Ronaldo with 122M Fans, Shakira with 104M Fans, Vin Diesel 100M, Eminem with 89M. The best introduction of you, your products, services and offers to Facebook is to “educate and inform” rather than to direct sell. For those of you that practice Attraction Marketing, this is good news! The reason that it is so very important for you as a business to understand this… is because you must begin to filter everything that you do through this new understanding. Facebook wants you to contribute to creating a positive user experience. Now does that mean that you can’t sell anything? Of course not. Does it mean that you can’t solve problems. Not at all. What it means is that you must learn the proper rules of engagement on Facebook to achieve any level of success with your efforts and if you follow these guidelines closely you will reap huge rewards. How Does Facebook Measure a Positive user Experience? Now how exactly does Facebook measure whether or not you are contributing or taking away from the user experience? It looks at how users are responding to your content. Both posts and paid ads. Do you ads receive positive feedback? Meaning are people liking, commenting, sharing, clicking, viewing video? Do they do nothing at all? This is not good. but not quite as bad as if they give negative feedback. Hide you post from their newsfeed. Report your ad. Unlike your page, etc. Facebook’s very existence depends on its users having a positive experience. If that ever stops Facebook will decline and lose its top spot. Facebook will do whatever it can to protect itself from losing its users. Which represent Nearly $10B a quarter in advertising revenue. Sure the advertisers are paying that bill but without users to click the ad, Facebook would not have the revenue. And Facebook is much more interested in protecting the user experience than it is in your ad dollars. Now there are three primary activities that you will engage in with your business on Facebook. And I will go through them quickly so that we can get to some ads stuff. 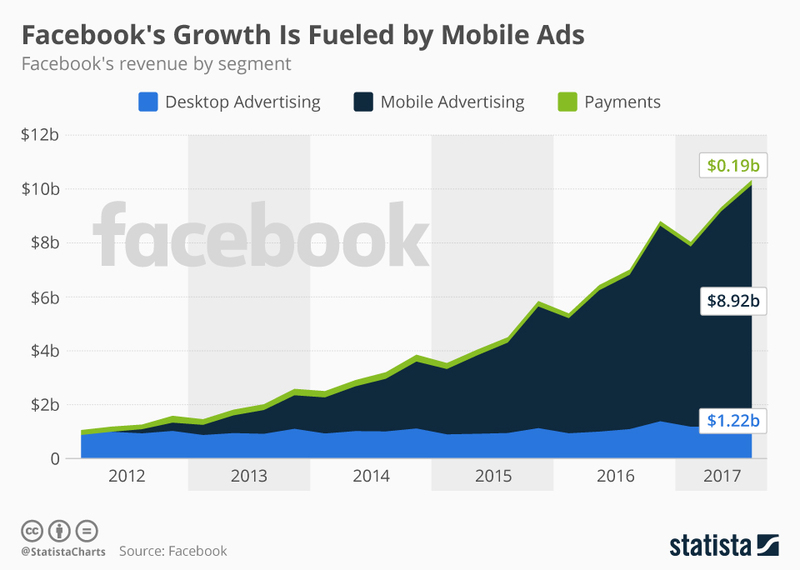 But this is important to understand as a part of this Facebook ads tutorial, as well as your overall FB marketing strategy. The first, is you want to build an audience. This is where you find and connect with your tribe. The second is you will engage with your audience. As your reach grows your audience will include those that you have targeted specifically and those who have found you as a result of your exposure. And third you will invite your audience to consume value. I call this Social Response Marketing. It is like direct response marketing in that you do have a clear call-to-action, and that you do track and measure your efforts. However unlike direct response marketing it appears more as an invitation than a sales pitch. This is very similar to what we teach here at MLSP with our Build, Engage, Sell formula. So again you will build your audience, you will engage with your audience, and you will invite them to consume value from your company. Now it is important to point out that this value exchange is not always to purchase a product or service. It may be an exchange that involves their contact information in exchange for your knowledge (what is often called a lead magnet in direct response marketing). It may come in the form of free download, a free quote, a free consultation, subscribe to your newsletter, or an invitation to visit your store if you have an actual brick and mortar business. 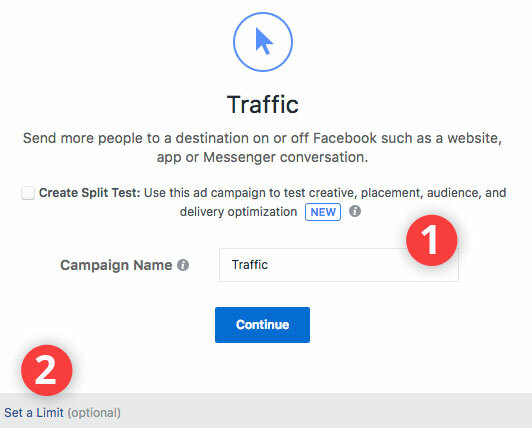 In fact what you see here above are a few of the call-to-action options made available from Facebook for their Lead Generation Ads. Most of my clients have active campaigns that focus on all three areas. Audience Growth, Audience Engagement, Social Response Marketing. OK Now that we have covered a bit of the rules of engagement for Facebook Friendly Marketing… Lets dig into how to create an Ad! It's now time to get your first Facebook ad live - and we're going to do so in a matter of minutes. First, though, we want to get you all on the same page so as we go through the process (and have you follow along step-by-step), we don't leave anyone behind. This may seem basic to some of you, but hang with me. I don’t want to leave anyone behind here. From the top down. 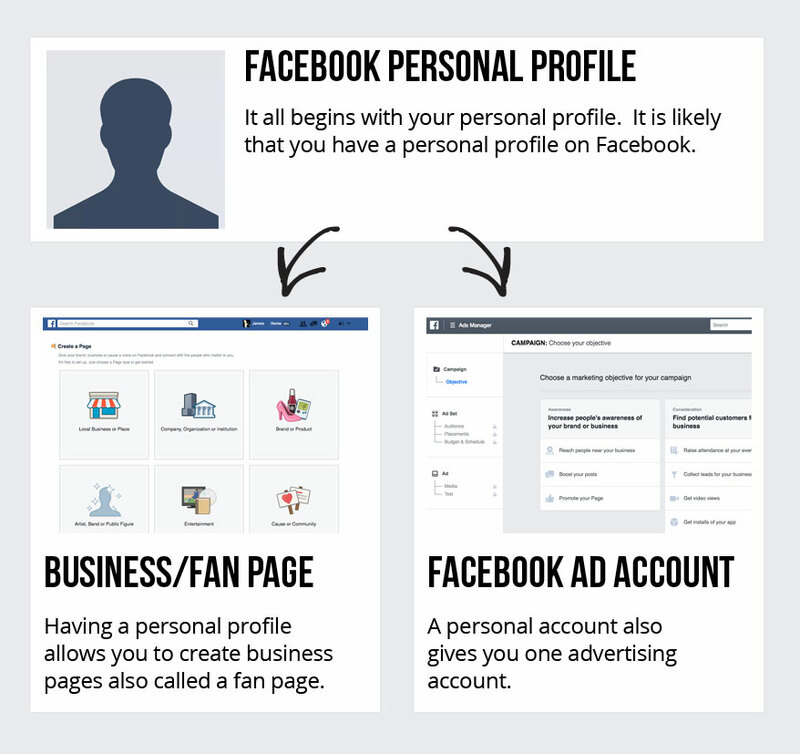 Let’s look at how your business engages with Facebook starting with your personal Facebook Profile, and the tools that are given to you once you have a personal profile. Now, having an ad account gives you a couple of powerful marketing tools. Let’s take a look at what those are and then we’ll go in to detail on how to use them. 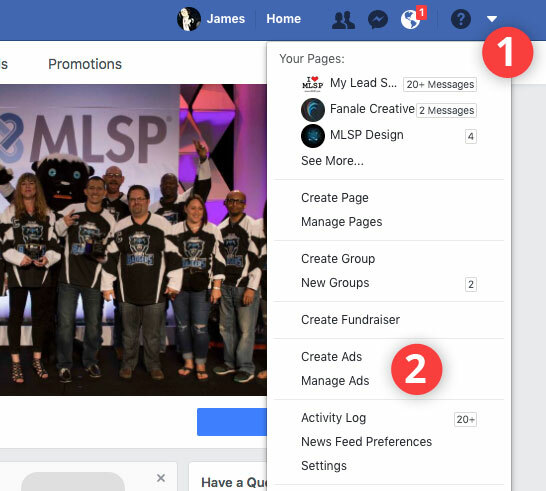 OK - Now that you know the tools that are available to you by just simply having a personal Facebook profile, let’s dive a little deeper in to the Ads Manager. The first think you’ll need to know is how to actually get to the ads manager screen. You start by using the drop down menu in the upper right of your Facebook screen once logged in. Once you select Create Ads, you will be taken to the screen pictured below. *NOTE: At the time of this publication, this is the most recent layout of the ads manager screen. If you have an old ads account, you may see a slightly different layout but it accomplishes the same thing. Let’s take a look at what you’ll see on the ads manager page, starting with the sidebar and what I call the Ad Creation Stages. Use the image below along with the descriptions for a full overview of the ads manager screen. To begin with… in the upper left corner you see your ad account id# If you have access to business manager or access to other ad accounts you would see them listed here in the dropdown menu. The column on the left is the work flow for creating your ads. Each step must be completed before you ad is ready to be published. These steps are covered in detail below but they are the Campaign Objective, Ad Set level (who/how/when people will see your ad), and the Ad level (what your ad says/looks like). And at the lowest level of the ad process you have your creative. This is what the target audience sees when you ad is displayed. Images, text, links, and call to action. We’re going to get started on creating an ad, but let’s take a look at the campaign view and see what kind of ad we can and want to create. You have three categories of objectives to choose from. The first is to build awareness. This would be if you want to build your audience on Facebook such as promoting your Facebook page. Or engaging with your fans by boosting your posts. The 2nd is consideration or as I like to call it, invitation. This is where you send traffic to your website, get video views, and create campaigns that generate leads for your business with verified Facebook contact information. You also have the ability to interact with Facebook Messenger. 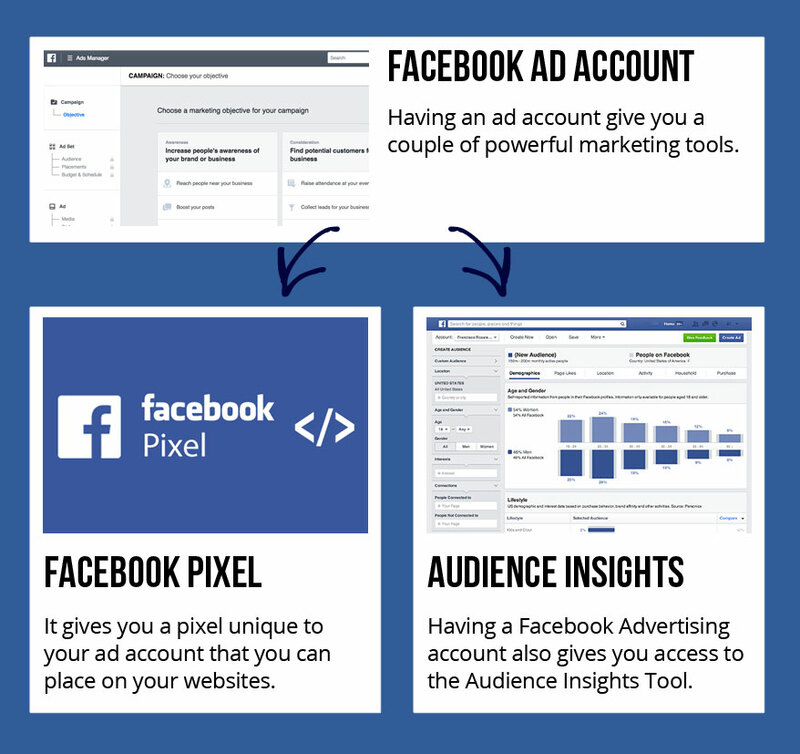 This last category is a bit more advanced than we will be covering here but it is where you make use of the Facebook Pixel to track conversions on your websites. There are 11 Objectives available across these three categories, you will likely only ever have use for these 6. You're On Your Way to Getting Your First Facebook Ad Created in Minutes! You will be presented with this additional section where you simply give your campaign a name. Name it something that will help you to remember the primary objective. Perhaps clicks to the website or name of the page that they land on. Now there is one other thing worth mentioning here. There is an optional section where you can set a limit for the campaign. How much you spend is usually managed in the next section at the Ad Set level. However if you know with certainty that you have exactly $100 to spend on this campaign and you don’t want to spend any more. You can set that amount here. To set a limit at the campaign level the minimum amount is $100. If you have never created an ad before, you may be prompted to go through the “Create Ad Account” process. It just takes a few clicks. Click on “Create Ad Account” and make sure the settings are correct. Click continue and you’ll be taken to the “Ad Set” screen which we’ll cover next. Once you have named your campaign, click Continue - You have just created your first campaign! 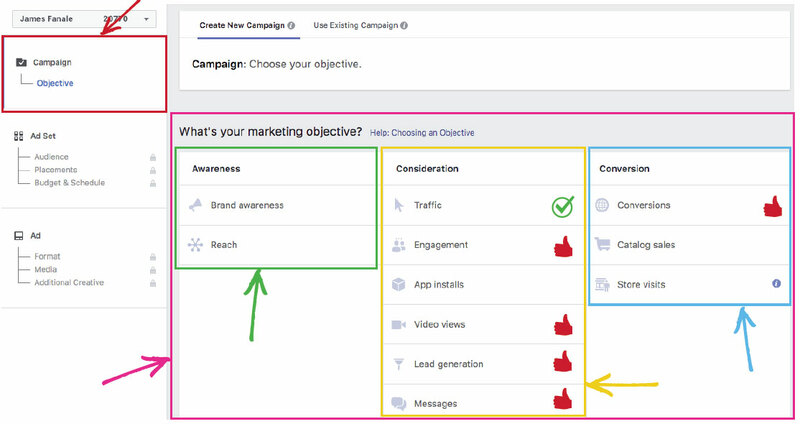 Now let’s take care of the Ad Set Level - You should be taken there after creating your campaign, but if not, just click on 'Ad Set' on the left hand side of the ads manager. This page looks like a lot, but we're going to break it down for you. Much of this page, especially if this is your first ad, you don't need to worry about for this tutorial. So keep following along. 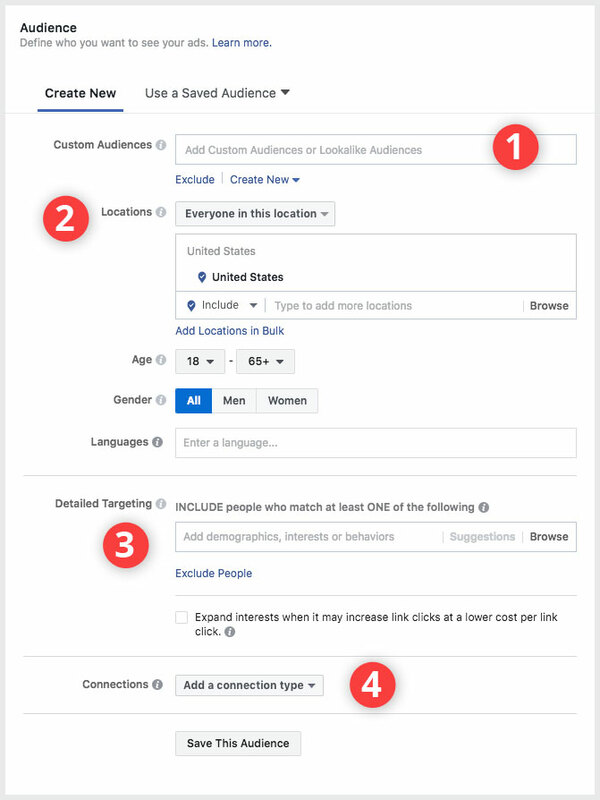 This is where you select the FB audience that you want to see your ad. As you can see this level has three sections that allow you to select WHO will see your ad, where they will see your ad and how much you would like to spend. We can bypass the 'Traffic' and 'Offer' boxes and scroll down to where it says 'Audience.' This is where we are going to select the audience that will see our ad. Here you can organize ads sets by audience segment. Sound difficult? Let's put that more simply. 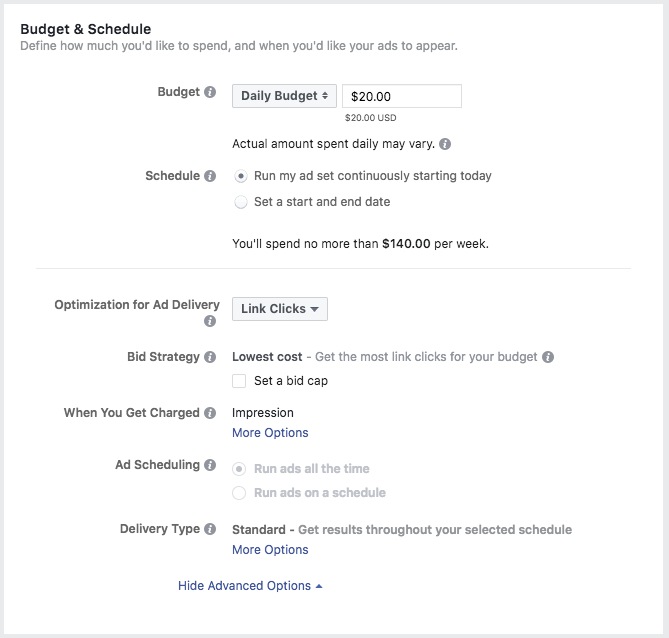 You want to use the targeting options Facebook gives you to create a SPECIFICALLY TARGETED AUDIENCE that you want to see your ad. This may be by interest, location, gender, age or other demographic. Don’t group too many interests into a single ad set or you will not be able to determine which interests are performing best. Use the image below along with the descriptions for a full overview of the ads audience selection screen. If you already created an audience, you can select it here. If not you can continue the process below to create one. This one is easy enough. Think about your target market! Where are they located, how old are they, is it gender or language specific? Choose that here. You can include (or exclude) people based on their interests and likes here. For instance, you can target people that like a particular brand, or personality, or business. This is an extremely powerful setting. Here you can choose to target (or NOT target) people that are already connected to you via things like liking your fanpage, or friends of people that liked your fanpage, etc. Choosing a small or highly targeted audience: The more targeted your audience in your ad set, the more likely the right people will engage your ad. However if you target too specific, then only a few people will see your ad. Choosing a large or broad targeted audience: A broad audience opens up your reach however you may be showing your ad to people less interested in what you have to offer. For your very first ads shoot for an ad set with a reach of between 500K and 1.3M people and narrow it from there based on who is responding. NOTE: The only way to know which targeting options will work best for your market is to test. Each market/niche is different. After you’ve determined your audience for your ad, it’s then time to select where your ad will be placed. Now your placement is going to be highly dependent on your overall goal. You can select MOBILE ONLY from the Device Types dropdown if you want to target ONLY mobile users. This changes if your goal is to get the visitor to fill out a form or pull out their credit card. In this case you may want to consider using the Desktop News Feed. NOTE: From my experience, Desktop Right Column should only be used for advertising to people that know you. A LOT HAS CHANGED WITH AD PLACEMENT! WATCH THIS VIDEO! Below is a video done by our resident Facebook expert Jesse Jameson. We HIGHLY RECOMMEND you watch this as it's a quick walkthrough with tips and tricks to get the most out of the ad placement options! Once you have your audience and your placement options selected, you now have to choose a budget. Obviously, this option is going to be completely up to you. $5 per day is the lowest amount you can spend. Personally, I would not recommend starting any higher than $25-50 for the first day. Let it run to at least 1000 impressions, see how it performs, and make your adjustments at that point. Now it’s time to head over to the ‘ad level’ settings where we will actually create the content for the ad itself. At this point, you’ve created your campaign and you’ve completed the Ad Set level of your ad (Audience, Placement & Budgets). Now, it’s time to decide what your audience will see. This section has a lot of options. 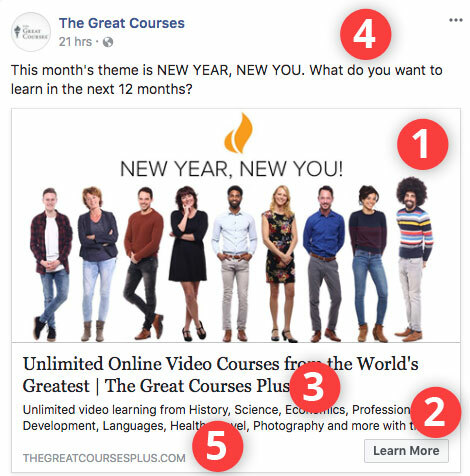 For ease of use for this Facebook ads tutorial, we’re going to keep this simple and for our format, we’ll select a single image. In order to cover the final 2 sections here (Media and Page & Links), let’s take a look at an existing ad and see what exactly you are laying out. 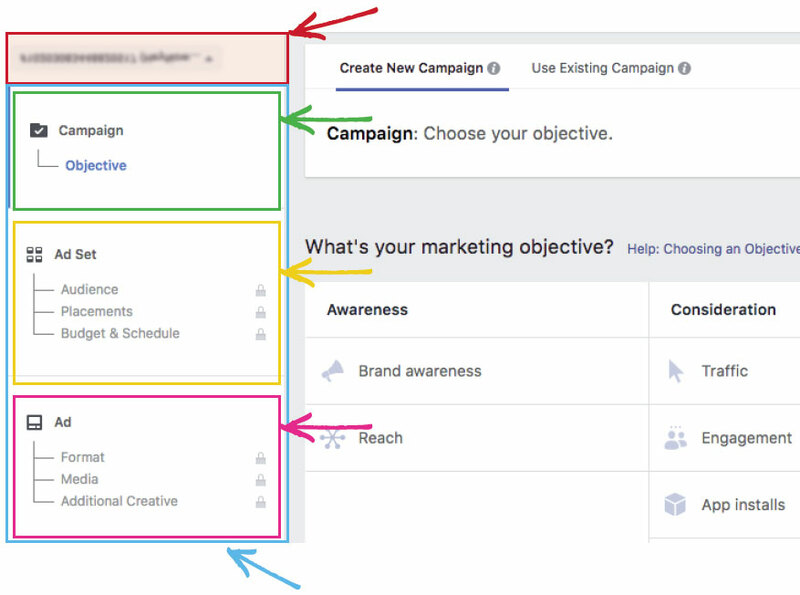 There are 6 elements to the Facebook ad creative. The Image, call to action, headline, description, text and URL caption. We'll go over each of these separately. Now I’ve done some pretty extensive split testing and here is what I’ve found. REGARDING A LOGO: If you are going to use a logo in your image, make it small. The results were fairly close between small and no logo, and both outperformed a large logo. REGARDING TEXT OVERLAY: In this split test we found that no text performed better than overlaid text on the image. It also had a consistently lower cost per click by 6 - 7%. Found under the Links Section, the call to action is the button that you see at the bottom of the ad. There are many options to select from. The most commonly used button is the Learn More. Followed by sign up, and shop now. I did want to mention a recent test that I did where in addition to the call to action below, I placed a link in the text area above the image. The result out of 5000 clicks? Only 5% of the clicks came from the link up top. 95% of the clicks came from the call to action below. I believe that people are becoming conditioned to engage that section of an ad. The headline and description settings are also found under the Links section. FOR THE HEADLINE: Keep it short and sweet is all I can say here. Shoot for between 4 and 9 words. Note that the 'link description' can be found in the 'advanced settings' area and is not shown in every ad placement. You can see below what this looks like in the Desktop News Feed placement area, while this is not shown at all currently in the Mobile News Feed area. For the website URL, this is where the user will be sent when they click on the Call to Action button, and is also set under the Links section. HELPFUL TIP: Through split testing I’ve found a number of words that typically help to illicit a response from your audience. These are, up, more, now, you, instantly, free, new and because. Let's Sum Up this Facebook Ads Tutorial! You should now see your ad in all it’s glory just waiting to be put in front of your chosen audience. At this point, all you need to do is click Place Order and you are good to go. Note that if this is your first ad, once you click on place order you’ll be asked to provide your credit card information in order to pay for the advertising. ACKNOWLEDGEMENT: We want to acknowledge and honor our dear friend and Facebook marketing phenom Jesse Jameson for providing the training above so that we could serve YOU, our beloved audience. Jesse runs the MLSP corporate advertising division, and has helped grow our audience and business immensely over the last few years alone. If you enjoyed this blog post, you may also enjoy our Facebook Messenger Marketing and specifically Manychat training. So are you ready to execute and setup a simple Facebook ad for YOUR business? Did this blog post help!? We’d love to hear your thoughts in the comments here! Is this the system for 149-150/month? I’m working with a mentor. Big thanks to MLSP, for your Blog and your hard work! Facebook allows brands the chance to enhance visibility across the globe. I am an online training provider and I have already started using these techniques to give the best to my students. Thanks a lot for your efforts and gratitude from India. I really like your content and how you illustrate your content with pictures. Hey Joseph – thanks for the kind words. Great to hear you got value from this article!